If there is one therapeutic activity I have recommended more than the hairs on my head, that would be MOVEMENT BREAKS. Student who can’t sit still? Offer movement breaks. Student who fidgets constantly? Can’t stay in line? Difficult time paying attention? Movement breaks! It’s always the answer. Movement breaks are simply a way of giving the child a break from the monotony of desk sitting to increase arousal of the central nervous system for increased attention and learning readiness. With unstructured play and recess declining, children aren’t moving their bodies at the frequency in which they need to for optimal learning. If you missed my post last week, I explored how closely movement and cognition really are. 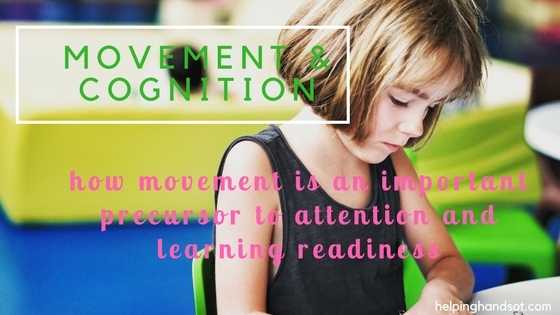 Current research fully supports the idea that movement is a necessary precursor for attention and learning readiness. Hopefully, one day soon, the school systems in America will start recognizing that. I dream of a day when 60 minutes of unstructured play and/or physical education would be the standard minimum. A day when recess and/or movement breaks would be intermixed into the curriculum throughout the school day. If you don’t know already, Finnish schools have fully embraced this concept and their students outperform ours in almost every category, including math, science and reading. In the meantime, though, we are working with what we’ve got! Restrictions for recess and pressure to fit in more curriculum have left some teachers at a loss for how to help their students attend to and absorb what is being taught. Cue my top 12 ways to incorporate movement in the classroom for increased attention. Our sensory systems are responsible for helping to keep our brains and bodies at an optimal state of arousal for learning. The most optimal state for learning and attention is calm and alert. You want your students to be calm, but not too calm where they are yawning and falling asleep at their desks. You want them to be alert enough to absorb what is being taught, but not too alert or hyperactive where they can't calm themselves down enough to attend. Different types of sensory input can have an alerting or a calming affect on the body and brain. Activities that involve just the right amount of vestibular and proprioceptive input can help your students be in that calm but alert state. Vestibular input - Refers to an activity in which the person "moves through space." Our movement and balance center is located within the inner ear, where receptors are located. Proprioceptive input - Proprioception is the concept of knowing where your body is positioned in space aka body awareness. Heavy work activities stimulate the receptors within our joints in order to help us know where we are in space. Proprioceptive input/heavy work is typically very organizing and calming for most, if not all, children. The activities listed below range in space and time needed but for the most part, they can take as little as 5 minutes to use. So when you see your students yawning, rocking in their chairs and fidgeting, take it as a cue that its time to take some sort of MOVEMENT BREAK. Move those desks aside, and get those little bodies moving! You will be blown away by the difference in attention levels after incorporating some of these movement break strategies. This movement involves crossing the mid-line of the body, which helps to synchronize the two hemispheres (right and left) of the brain, so that the whole central nervous system is working together as a unit. This is important during reading and writing, as the visual-occular system has to work as a unit, crossing midline to visually scan letters from left to right. This movement (the cross crawl) is part of a movement-based curriculum called the Brain Gym, that promotes intentional movement to promote optimal learning. Start by having the children stand up at their desks. Turn around so they can mirror your actions. Have them lift their left leg and tap the right elbow to the left knee, then switch and tap the other side. Repeat for a count of 20-30. For younger children (preschool aged), you can use alike stickers on the right hand and the left knee to help them cross over (“match the stickers”). If the balancing on one leg is too challenging, have them sit down and tap opposite knees. Remember to cue them to initially go VERY SLOW when trying this activity. Offer alternative seating options that involve movement such as rocking chairs, therapy balls, wiggle wedges, bean bags, etc. 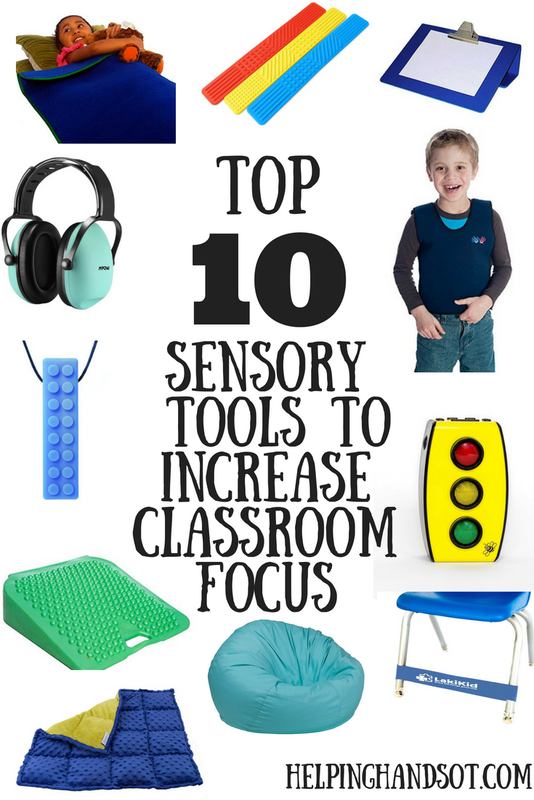 This will not only allow students to get all their wiggles out, but it is going to give them all that good vestibular and proprioceptive input they are craving to help them pay attention. Children can learn while standing! I love how creative and savvy some teachers are getting in their classrooms with this concept. I still think it needs to be more widespread. 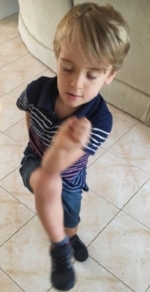 Rhythmic dancing, singing and gross motor movements combined can be a great and fun way to "shake it out" to prepare the brain for learning. Some classic favorites of mine include "If You're Happy and You Know it," "Shake Your Silly's Out," & "Head, Shoulders, Knees & Toes." 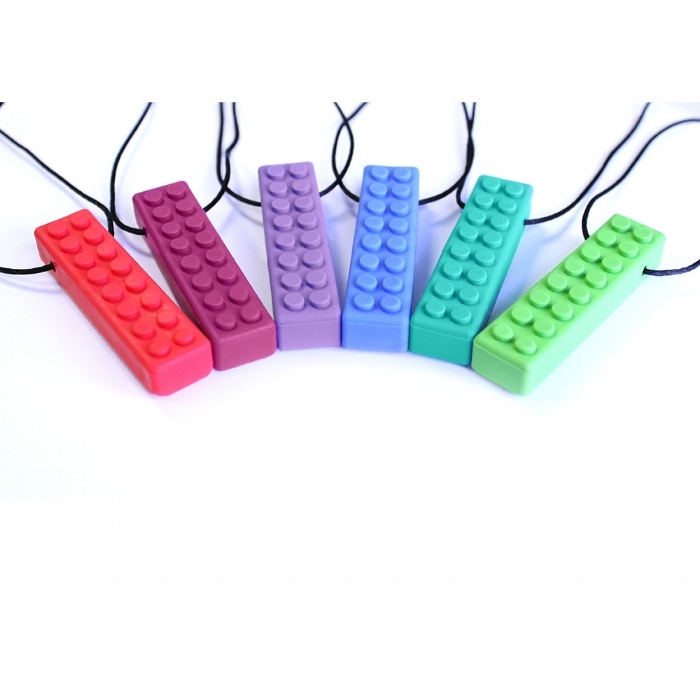 The tactile and proprioceptive input in these songs help increase body awareness and attention. Quick kid-style yoga poses can work wonders for integrating both sides of the brain for writing and reading. Yoga also increases proprioceptive awareness of the body in space, improves strength, balance and helps develop the core muscles. Rhythmic, slow and deep breathing is important to encourage during these poses to relax and calm the central nervous system. Here are a few simple poses you can try. They only take a few minutes so you can work these into your day at any time. This is another intentional movement for optimal learning included in the Brain Gym curriculum. 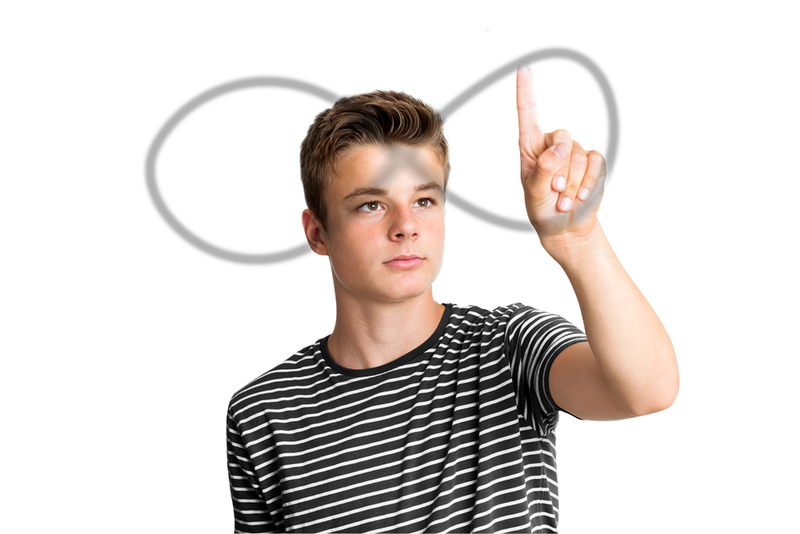 You have your children trace a horizontal Lazy 8 with their finger, while simultaneously tracking their finger around the track with their eyes. Repeat 10 times or more. This movement is incredible at helping to integrate the ocular-visual systems by crossing midline for improved attention and reading skills. It would be a great exercise to try before reading or spelling. There are so many ways you can do this activity. You can trace invisible Lazy 8's in the air or you can have a pre-made "race track" with a car to drive around the track 10 or more times. Set up your lessons at different stations throughout the room as an easy way to offer a change in movement and position. You can have one station be seated at a desk, the next sitting in a bean bag chair circle, the next lesson laying on tummies on the floor, the next standing up at a taller standing desk desk or doing an activity at the chalkboard. Were talking about children here, after all. Children were designed for frequent movement and play, not sitting at a desk for hours like an adult in an office. Set up a loading and pushing/pulling station in your classroom. Pushing heavy objects is an easy way to increase proprioception/body awareness and attention. My favorite way to accomplish this is by filling cardboard blocks with something heavy, like rice or beans. When you have a student who is having a hard time sitting still and needs a quick movement break, put him/her “to work.” Have then load a wagon, a paper cart or even a rolling chair with all the blocks and then push it around the classroom. You could even label each weighted item with a letter of the alphabet for practicing spelling words or numbers for counting/math. 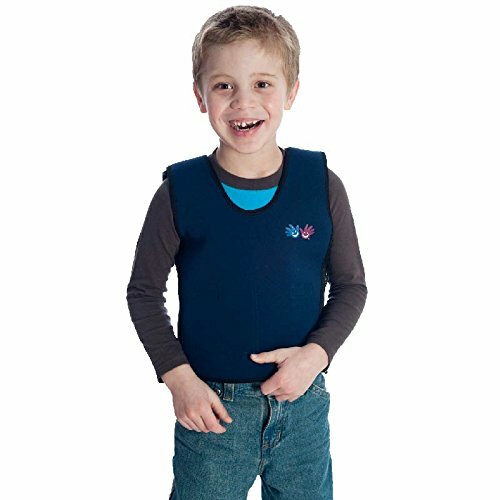 These upper body warm ups are great for activating those stability muscles of the scapula, shoulder, arm and wrist to prepare little hands for writing. 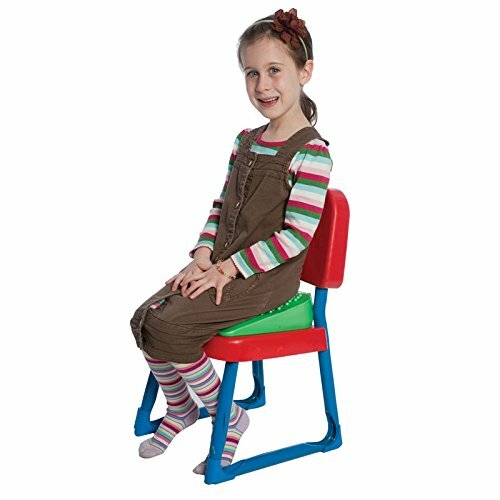 If you're children are slouching in their chairs (which they typically are), this is going to help get their posture upright in order to provide a more stable base for them to begin writing. Here are my three favorites. Alligator Snaps: Reach your arms up towards the ceiling as high as you can reach! Now clap your hands together, like an alligator snapping his jaws shut. Shoulder Shrugs: These are great for releasing any tension in the neck and shoulders. A lot of children tend to hike their shoulders during writing activities due to weakness/lack of stability. This will help position the shoulder in a relaxed and retracted position. Butterfly Circles: Reach both arms forward with thumbs extended and make an X with your thumbs (hands open). This should resemble a butterfly. Now make your butterfly circle 5 times to the right and 5 times to the left. Wheelbarrow walking engages the proximal and distal muscles of the upper extremeties, the core, the vestibular system and gives great organizing proprioceptive input to the body. 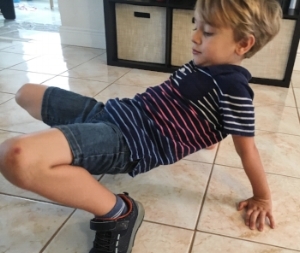 Crab walking is one of my favorite heavy work activities that is organizing and calming but seems to give just the right balance of alert and calm for most children. Since they are moving through space, you are also stimulating the vestibular system as well. Have your kids line up on one side of the room and have them take turns walking sideways in a crab walk position across the room, all the while trying to balance a bean bag on their tummy. Instead of drilling math flash cards or spelling words on the chalkboard or verbally, try building the lesson around a fun movement. Set up a simple obstacle course within the classroom for kids to jump hop scotch, balance on balance beam and then do 10 jumping jacks before giving an answer to each math flash card. Or have them skip from one side of the room to the other before spelling out a new word. Take a five minute break from the the lesson and play a quick game of Simon Says. It not only gives them a chance to move their bodies but it also helps to increase body awareness in a organizing and calming way. Another reason I love the game Simon says is because it increases auditory processing (the way children hear what is being said and then internalize that information). Basically, this game will get bodies moving and also make sure those little ears are turned on! What are some of your favorite ways to incorporate movement breaks throughout the day? Let me know in the comments below! Most neuroscientists around the globe agree that movement is strongly tied to cognition and learning, yet we are seeing a drastic drop in opportunities for movement and physical activity within the school setting. Schools aiming to improve their students performance on standardized tests are cutting out recess, physical education, music and arts programs in order to make more time for academics and test preparation. Recess allotment times are being cut down to 15-20 minute increments and many schools have opted to take recess out completely. It is common for first and second graders in public schools to have no break from learning at all, a fact that makes me wince every time I read it. The problem is that despite all these efforts, US student’s academic performance still lags that of their peers in many other countries. In fact, the United States underperforms on standardized tests in math and science when compared to many other industrialized nations. The Programme for International Students (also known as PISA) is a nation-wide test that measures reading ability, math skills and science literacy for 15-year olds across the nation. The most recent PISA scores (taken in 2015) ranked the US, a nation who spends more capita per student than almost any other nation, an unimpressive 38th out of 71 in math and 24th in science. The students scores are struggling but the real ugly truth is that the children themselves are suffering within the school environment more than ever. Childhood depression and anxiety rates are higher than they’ve ever been. ADHD diagnoses have been on a steady incline over the past several years. Students who crave movement more frequently than others are viewed as an interference, or often referred for therapy, due to their "inability to sit still". Developmental Delay, ADHD and Sensory Processing Deficit referrals for occupational therapy services are steadily increasing. According to the CDC, recent surveys show that over the past 12 years, diagnoses for Developmental Disability have increased by 17.1% and Attention Deficits Disorders have increased by 33%. I refuse to believe that our children are the ones that are getting less "capable of learning." I whole-heartedly believe it is an environmental issue. I believe the problem lies in the systems in which we are placing our children in. Rather than suspecting a flaw within the system, the children are often viewed as flawed themselves if they have difficulty adhering to the standard protocol. The contrast between what is taking place in schools and what has been concluded in research labs worldwide over the past 20 years regarding the necessity of movement for priming the brain for learning is truly confounding to me as a parent and a therapist. The amazing truth that these studies point to is that even if an active motor output (i.e. a movement of the body) may not occur when learning something new, the movement center of the brain, the cerebellum, is still actively working during all of these above learning experiences. During learning (of language/memory/attention or anything through the visual system such as reading new material) the cerebellum is actively working to sequence, time, practice, correct and rehearse these new skill before it is ever carried out. This just goes to show how strongly interconnected movement and learning of all kinds are! Let me introduce you to the cerebellum, the motor control center of the brain. It is located at the base of the skull and is densely packed with neurons. It has some 40 million nerve fibers—40 times more than even the highly complex optical tract. (6) The interesting thing about these nerve fibers is that they don't only run from the cortex to the cerebellum, but most of these nerve fibers are actually outbound, meaning they travel from the cerebellum back to the the cortex (7). Basically, during learning, information is sent to the cerebellum, where the absorbed information is processed, practiced, timed, rehearsed and corrected before it is sent back to the areas that create the motor response or action (i.e. learning a new sport: action is to swing the bat, learning a new word: action is saying the new word, learning a new math skill: action is performing the math problem) . What this all means is that the cerebellum, or movement center, is an integral part of the learning process. That almost every type of new information processed and learned in the brain must pass through the movement center of the brain before it becomes an acquired skill or new piece of cataloged information. A study out of the University of Illinois discovered a link between fitness levels of 9 and 10-year old children, cortical thickness and math scores. Specifically, the study positively correlated higher fitness levels with higher math scores and thinner cortical sections, signifying higher brain maturation. Another study by Terrence Dwyer found that exercise improves both classroom behavior and overall academic performance. That study reinforced the results of a 1998 study, which found that when 43 fourth-grade students were given recess, they worked more or fidgeted less than when they were not given recess. These are just a handful of study among hundreds of supporting research. Thankfully, mainstream media and in-tune parents and teachers are catching on, even though public policy changes are lagging. Play-based, nature-based and alternative schools are rising in popularity and play and recess restrictions are making big headlines. Recently in Florida, recess proponents, otherwise known as "recess moms," helped pass the daily recess bill, requiring that every elementary student in Florida be allowed 20 minutes of uninterrupted recess every day. Since research studies continue to show that children need at least 60-minutes of physical activity a day, savvy teachers are getting creative about their classroom structure and schedule, to allow for more movement breaks throughout the day. Sensory input is simply what our senses (sight, touch, smell, taste and hearing) take in and send to our central nervous system. In my experience as a pediatric occupational therapist, I have found that engaging different sensory systems can significantly impact a child's academic performance and attention. Sensory input can be either stimulating/alerting or calming. Alerting/stimulating sensory input correlates with increased attention and readiness to learn, while other types of sensory input can help to calm an overly anxious or rambunctious child down. Sitting down for for long periods of time (typical in most kindergarten programs) while information is being dictated does not stimulate the senses. It engages the auditory system only, which is often a less developed system in young children. 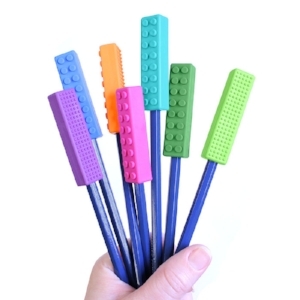 This will help prime the brain for learning within the four walls of a classroom. So what are you waiting for? Parents, get your kids outside as much as you possibly can. Talk to your school administration and school district officials about your concern with the lack of physical activity at your school. Speak up! Talk to other parents and teachers about your concerns about recess restrictions. Call or email local congressman. If you’re passionate about it like I am, become a play advocate or recess mom like me. Stand up for your child’s right to be a child. Teachers, I can imagine that restrictions and time-constraints within the school system make it tough. But get creative, move those desks aside and get those little bodies moving, touching, feeling, seeing and doing! Give as many quick movement breaks as you can. Find a way to fit in physical activity. Talk to administration about your concerns too. Lets all agree to fight aside one another to change the system in order to meet the needs of the children instead of trying to change the children to meet the needs of the system. 12 Ways to Incorporate Movement in the Classroom (for Increased Attention). 4. Desmond JE, Gabrieli JD, Wagner AD, Ginier BL, Glover GH. Lobular patterns of cerebellar activation in verbal working-memory and finger-tapping tasks as revealed by functional MRI. J Neurosci. 1997 Dec 15;17(24):9675-85. PubMed PMID: 9391022. 5. Allen G, Buxton RB, Wong EC, Courchesne E. Attentional activation of the cerebellum independent of motor involvement. Science. 1997 Mar 28;275(5308):1940-3. PubMed PMID: 9072973. 7. Middleton FA, Strick PL. Anatomical evidence for cerebellar and basal ganglia involvement in higher cognitive function. Science. 1994 Oct 21;266(5184):458-61. PubMed PMID: 7939688. 9. Dwyer, T., Sallis, J. F., Blizzard, L., Lazarus, R., & Dean, K. (2001). Relation of Academic Performance to Physical Activity and Fitness in Children. Pediatric Exercise Science, 13, 225-238.